Beginning January 1, 2020, when submitting claims to Medicare for advanced diagnostic imaging services under the Medicare PFS, Hospital Outpatient Prospective Payment System or Ambulatory Surgery Center payment system, furnishing professionals and entities (including hospitals) must certify that professionals ordering advanced diagnostic imaging services consulted AUC applicable to the imaging modality. Following the one-year testing phase, providers who fail to report this information on a claim will not receive payment for that service. The original implementation date of this requirement under Section 218 of PAMA was January 1, 2017, but CMS delayed the effective date multiple times and is now including a further transition period to ensure stakeholders are prepared for program implementation. Providers who fail to report this information on a claim will not receive payment. Furnishing professionals and entities will be required to specify on the claim which qualified clinical decision support mechanism (CDSM) was used to consult the AUC, and whether the service ordered adheres to those criteria. 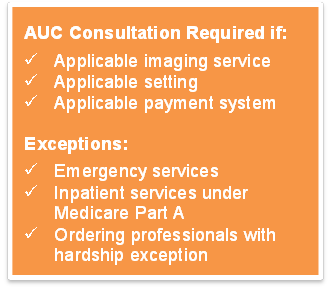 At least initially, it will not be required that the imaging service furnished actually adhere to the AUC, just that the AUC be consulted. However, compliance with AUC is a potential program requirement in the long term. Additionally, CMS is seeking input from stakeholders on the data elements and thresholds that the agency should consider in identifying outlier ordering professionals who would, in the future, be subject to a prior authorization requirement when ordering advanced diagnostic imaging services. 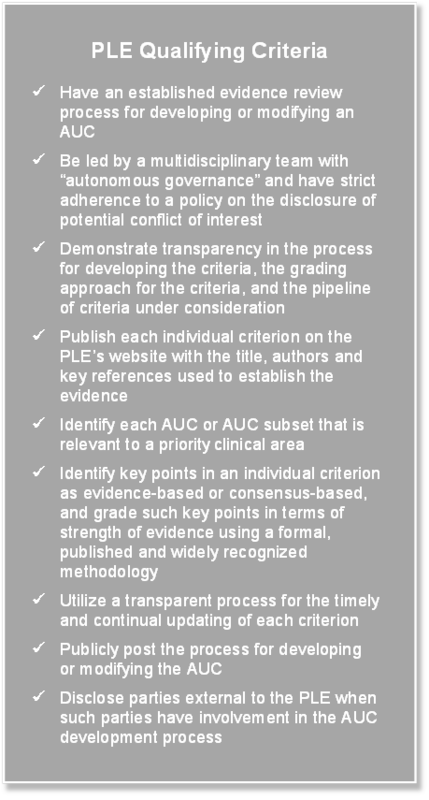 PAMA requires CMS to assess whether the criteria under the AUC program are “scientifically valid and evidence-based.” CMS is relying on AUC that have been developed, modified and/or endorsed by PLEs that are selected through an annual application process. Rather than reviewing each criterion published by a PLE, CMS utilizes a qualification and review process to select qualified PLEs based upon requirements set forth in regulation. PLEs are required to submit their application by January 31 of each year and, if approved, receive a qualification for a five-year period. To date, CMS has completed three rounds of review of applications for organizations seeking to become qualified PLEs. Currently, there are 20 organizations—a combination of medical societies and providers—qualified as PLEs; the full list of organizations can be found on the CMS website. If there are multiple criteria for a specific condition-imaging combination, the practitioner can choose the criteria that best align with local practice customs. When developing the criteria, PLEs can allow for different pathways or options that may come into play depending on clinical practice. Local provider organizations can seek to become qualified PLEs and then develop their own AUC. While CMS has established strict requirements for PLEs, it acknowledges that there is still a risk that non-evidence-based criteria could be developed or endorsed in the program. To minimize that risk, CMS is allowing public stakeholders to submit comments—as part of the standard rulemaking process—on potentially non-evidence-based criteria. Once identified, non-evidence-based criteria will be reviewed by the Medicare Evidence Development and Coverage Advisory Committee (MEDCAC), which will make a determination on the details provided. At a minimum, ordering professionals are required to consult applicable AUC for these areas, and adherence with such criteria will be used, in part, to measure clinicians’ utilization for purposes of designating provider outliers. In the future, clinicians who are designated as outliers may be subject to additional prior authorization requirements when placing orders, but CMS has indicated that it will establish specific methods for determining outliers and will specify any resulting requirements in future rulemakings. Ordering professionals are required to consult AUC through a qualified clinical decision support mechanism (CDSM) on or after January 1, 2020. Appreciating the time and burden of obtaining an exception, CMS proposes to allow for the ordering professional to self-attest when experiencing a qualified significant hardship at the time of the order. The ordering professional would communicate the information with the required documentation, and the furnishing professional and facility would reflect that on the claim by appending the appropriate modifier. In order to access the library of applicable AUC offered by PLEs in the program, practitioners are required to utilize a qualified CDSM that allows them to electronically interface with available criteria in a streamlined fashion. In the CY 2017 PFS rule, CMS defined a CDSM as “an interactive, electronic tool for use by clinicians that communicates AUC information to the user and assists them in making the most appropriate treatment decision for a patient’s specific clinical condition.” The CDSMs may be modules within or accessible through certified EHR technology or private sector tools independent from EHR technology. Initially, CMS has not been prescriptive about specific IT standards for the CDSMs given the continuously evolving IT and EHR environments. There is an emphasis on the need to be integrated as seamlessly as possible. Applications for the first round of CDSMs were due in March 2017, with the first list of qualified CDSMs published in June 2017. As of July 2018, 11 CDSM tools have received full qualification, with an additional seven tools receiving preliminary qualification. The list of full and preliminary tools can be found on the CMS website. The final component of the program that CMS has yet to define is its approach to identifying outlier ordering professionals. Individuals identified as outliers would, at a future point in time, be subject to prior authorization requirements when ordering advanced diagnostic imaging services. While CMS has existing prior authorization programs, these programs have not focused on identifying outliers. Therefore, CMS is seeking input on the different data elements and thresholds that should be considered as CMS defines its methodology. CMS notes that the first year of data for this analysis would be CY 2021 claims data given that CY 2020 is an operational testing period for the program. As a result, stakeholders should expect further discussions about the outlier methodology and process in the CY 2022 and CY 2023 rulemaking cycle. For more information contact Deborah Godes or Eric Zimmerman.